Flashback Friday: Baltimore no-hitters, and "The Summer of the Near Miss"
Chris Tillman returns to a big league mound on Saturday for the Orioles against the Blue Jays. Tillman got the call up to the parent club after a successful stint in Norfolk that included a no-hitter against the Gwinnett Braves on April 28. 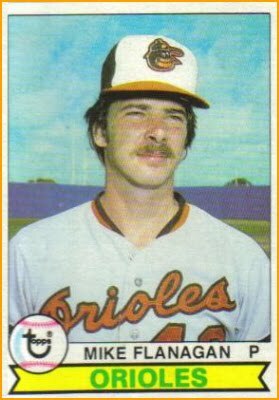 The Orioles’ most recent no-hitters came against the opponent that just left town, the Oakland Athletics: Bob Milacki, Mike Flanagan, Scott Williamson, and Gregg Olson tossed a combined no-hitter against the A’s in 1991; meanwhile, Jim Palmer posted a solo effort in 1969. Fittingly, the team’s website categorizes no-hitters under the heading “Rare Feats.” (Pretty soon they’ll have to include winning seasons in that category as well.) Also rare is that the O’s pitched no-hitters in three consecutive seasons from 1967 to 1969. But when it comes to no-hitter-related novelty, it’d be tough to match the summer of 1978. Call it “The Summer of the Near Miss.” In the span of a little more than two weeks in August 1978, three different Baltimore pitchers carried no-hitters into the seventh inning only to lose them around stretch time. First was Scott McGregor on Aug 9. After recording two seventh-inning ground-outs to the left side of the infield, McGregor allowed a two-run double to Hal McRae. Four consecutive hits produced two Royals runs and McGregor took the 2-0 loss at Memorial Stadium. Final line: nine innings pitched, five hits, two earned runs, four strikeouts, and one walk. Next came Mike Flanagan on Aug 21. Facing the A’s, Flanagan gave up a run-scoring single to Rico Carty in the seventh, shortly after he considered the possibility of pitching a no-hitter. Said Flanagan: “I started thinking about the no-hitter after six innings. ‘There are nine outs to go,’ I kept telling myself, but the no-hitter was secondary.” The O’s won 3-2 at Oakland-Alameda Coliseum. Final line: nine innings pitched, three hits, two earned runs, eight strikeouts, and three walks. Four days later, on Aug. 25, Dennis Martinez thought about the no-hit possibilities in the fifth inning of a home game against the Mariners. Catcher Rick Dempsey told him, “Let’s go throw a no-hitter,” to which Martinez responded, “Why not?” With two outs in the seventh, Mariners third baseman Bill Stein ended Martinez’s bid with a single to centerfield. Final score: Orioles 5 – Mariners 0. Final line: nine innings pitched, two hits, no runs, four strikeouts, and six walks. September 26. Ninth inning. Two outs. Orioles lead the Indians 3-0. No hits for Cleveland. Flanagan on the mound. Three thousand fans on their feet at Memorial Stadium. Two-one count to designated hitter Gary Alexander. Flanagan goes with the curve, Alexander goes deep. 1 Response to Flashback Friday: Baltimore no-hitters, and "The Summer of the Near Miss"
Hello, I apologize for contacting you in this fashion, but I think you might be interested in submitting your site to my new sports directory…at thesportszone.orgI'm assuming comments are moderated so when I click submit this post won't automatically appear on site, if it does, I again apologize.